It is chaos. With around 70 – 80 thousand viewers at a time, people are constantly inputting controls day and night, such as “Up,” “Down,” “A,” or “B.” At one point the stream created a “Democracy Mode.” So now viewers can input “Anarchy” or “Democracy” to vote on whether they want everyone to be able to input commands separately or vote on commands. The game has stayed mainly on “Anarchy.” Many contributors have stated that it makes the game more challenging. At this point Red has four badges. He has just left the Pokemon Tower in Lavendar Town and awoken the sleeping Snorlax with the Pokeflute. Here are some notable things that have happened. – Starting Pokemon Charmeleon and a Ratatat were accidentally released via Bill’s PC. – Players took multiple hours to cut down a tree. – Needing a Pokemon to eventually learn surf, players set out to evolve Eevee into a Vaporeon, but accidentally bought a fire stone and evolved him into Flareon. Late in the game Flareon was accidentally released via PC. – After hours of progress beating Giovanni at the top of the tower, Giovanni drops the “Silph Scope,” a necessary item needed for the next part of the game. Instead of picking it up players accidentally use Ratatat’s (Raticate now) dig to leave the building and go to the nearest Pokemon Center. The current party consists of a a Pidgeot, a Raticate, an Oddish, a Ghastly, a Drowzee, and a Farfetch’d. Many nicknames were accidentally given to these Pokemon which are usually just a random combination of letters. 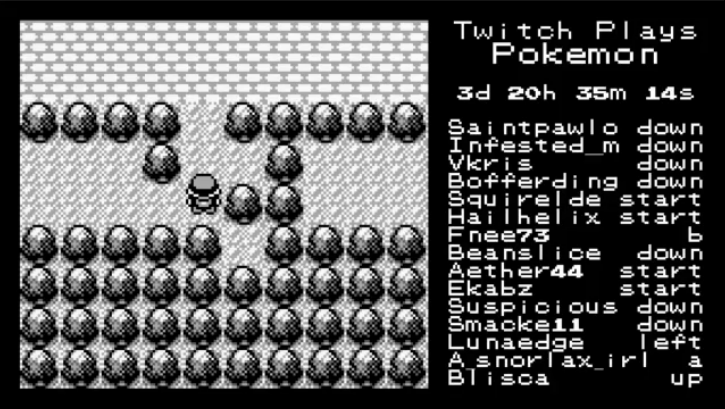 Through /R/twitchplayspokemon on Reddit. People have created fan art and perhaps a religion based on the games progress. 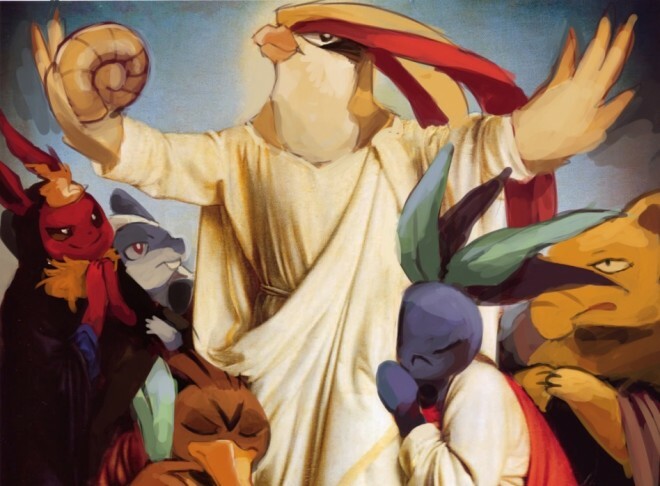 Pidgeot being the stronger Pokemon, he has been often compared to Jesus. Many proclaiming that the Helix Fossil is the all-knowing item of worship. This came about, because Red would often check his items and try to use the Helix Fossil before being told that he couldn’t by Professor Oak. Many believed it was a sign that Red always needed to look to the Helix Fossil for guidance. People referred negatively to the Dome Fossil as a side of evil, and more recently a part of the side of Democracy. Flareon was widely considered evil, and often blamed for the release of Charmeleon and Ratatat. People referred to Flareon’s release as banishment due to his misdeeds. So yeah, it’s pretty crazy, and pretty entertaining to follow both the reddit crowd and the live stream itself. Who knows how long it will take for Twitch to complete the game, but it’s definitely an interesting experiment.